If you’re using Asterisk/FreePBX you’re probably using CID Superfecta for you caller ID lookups. We started noticing that if the # wasn’t being provided, the name returned was CID Superfecta! which looks odd to users. I started digging in and figured out that if a CID isn’t provided the trunk will provide 5555555555. The CNAME is: CID Superfecta! I found a bug report for CID Superfecta that shows resolved where 5555555555 was returning CID Superfecta! from the trunk. That seems to be exactly the issue but that was fixed in Superfecta v13.03.19. I checked for module updates I had the latest but still had this issue. But, there’s an easy workaround. Just add an entry for 5555555555 to the Asterisk Phonebook and set that CNAME to whatever you want. I set mine to “Unknown” and since we have Asterisk Phonebook at the top of the CID Superfecta sources this now returns Unknown rather than CID Superfecta!. 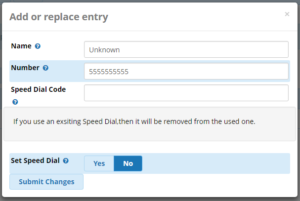 A little tip if you want to test, prefix your # with *67 to temporarily block your caller ID. *67 just blocks the CID for that one call so it’s a great way to test from your cell phone.